Dearest Blog: Yesterday I donned my brand new Turtle shirt and headed out to Marquee Cinemas for Teenage Mutant Ninja Turtles: Out of the Shadows. Spoiler level here will be mild, nothing you wouldn't know from the trailers. Michelangelo, Donatello, Raphael, and Leonardo risk exposure to save their beloved New York from the evil Shredder's latest nefarious plot. Dear Reader(s) the best and most important thing I can tell you about Out of the Shadows is this: the movie is EXACTLY as advertised. If you pay your cinema dollars to see this because the trailers look like fun to you, you will have a great time. If you pay your cinema dollars just to complain that it isn't The King's Speech, well...I feel a little sorry for you. The movie opens on a beautiful aerial shot of New York City, and, throughout, the City serves as an important supporting character. Famous landmarks are prominently placed, and both the Knicks and Rangers enjoy a bit of Turtle PR. TMNT2 boasts some nice action sequences, with well-choreographed fights and exciting chases. The effects are solid, and the CGI looks good, in particular as regards the Turtles' facial movement and expressions, which are terrific. Of course the movie's principals are heard and not seen, but the supporting faces are notable: Megan Fox, Will Arnett, Laura Linney, Tyler Perry, and Dean Winters. Newcomer Stephen Amell brings an earnestness to Casey Jones that is notably lacking in his Oliver Queen. The film is quite funny, if often juvenile, and the soundtrack boasts some pretty cool tunes. Teenage Mutant Ninja Turtles: Out of the Shadows clocks in at 112 minutes and is rated PG13 for "sci-fi action/violence." If you saw TMNT2 and didn't enjoy it, I can only ask, in the words of another famous turtle: "Why don't you like fun?" 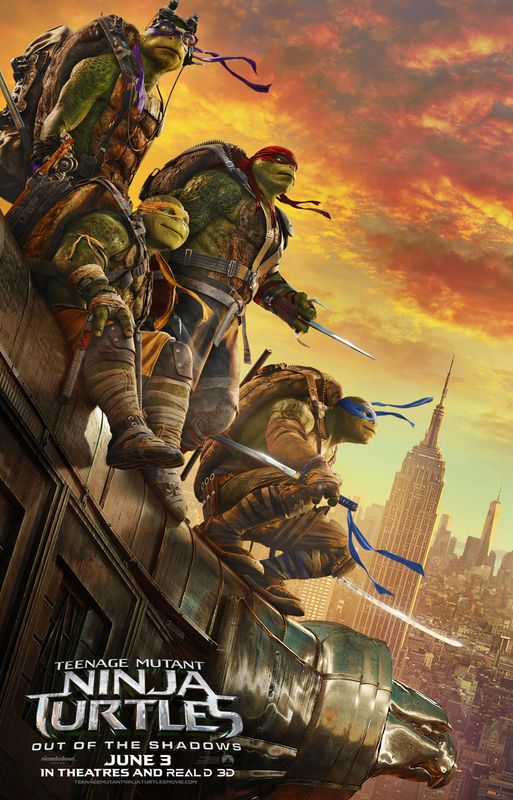 Of a possible nine Weasleys, Teenage Mutant Ninja Turtles: Out of the Shadows gets seven. Even better, Out of the Shadows has some of the greatest 3D effects I've ever seen in a movie. Loads of pop outs and the 3D effect is very powerful for the whole movie, even more than the first one. I love it and only fan support will allow for a sequel, part 3. Don't wait, buy it today if you're a true Teenage Mutant Ninja Turtles Fan!